Kuching is the capital of the East Malaysian state of Sarawak on Borneo. Kuching is the most populous city in the state of Sarawak and the fourth largest city in Malaysia. Kuching means “cat” in Malay. The Gunung Mulu National Park in Borneo (near Miri) is a UNESCO World Heritage Site with caves and karst formations. The caves are home to over 5 million bats who exit the caves in search for food every evening in a spectacular way. Elephant Orphanage Sanctuary about 100km (2 hours driving time) east of Kuala Lumpur has been translocating elephants since the 1980s. The sanctuary is open to public. Hill resort at 1,500 meters above sea-level on the Titiwangsa mountain range, about 100km north of Kuala Lumpur. Originally set up as a tin-ore trading post in the 1890s, it consists of seven hills. 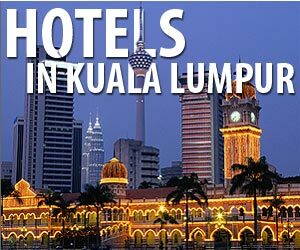 Bukit Tinggi is a hill retreat area about 55km northeast of Kuala Lumpur with resort hotels - most notably the french village themed Colmar Tropicale, a japanese garden, botanical garden and activities like horse riding, paintball, mountain biking and golf . Genting Highlands is resort city on a mountain top (1800m above sea level), about 55km north-east of Kuala Lumpur with Malaysia's only casinos and theme parks, restaurants and hotels. A trip to Kuala Selangor at estuary of the Selangor River usually includes river boat tour see Firefly colonies living in the mangroves as well as visiting Bukit Melawati and a seafood dinner. The Nature Park is also worth a visit. Rainforest B&B is a guesthouse in Bukit Bintang, the outside of the building looks like a forest covered with trees and plants.